During 2017, the security environment around the globe changed dramatically — terrorism, cyber warfare, border management and natural disasters are examples of the challenges that are increasing the complexity of today’s world. Today’s satellite technologies are helping organizations enhance security through reliable tracking of assets and people. However, these systems simultaneously deliver many operational benefits. Gavan Murphy explores how flexibility, functionality and reliability all come together with satellite solutions for security. Their destination was a stricken community in Puerto Rico, but for how long they were unsure — the extent of the damage was unknown, as the Category 4 storm had wiped out all communications. The United States military has long enjoyed a tactical advantage from space — SATCOM, GPS and other satellite services and capabilities have given our warfighters an edge on the battlefield. But this hasn’t gone unnoticed by our adversaries. Interference won’t go away unless the industry supports a fix for the problem — interference effects the delivery and issuance of mission data for militaries and governments as well as revenue generation for commercial entities. Users expect efficiency and reliability from satellite — ignoring the problem only compounds the problem further and damages the reputation of the industry. Interference is a serious issue for satellite operators. 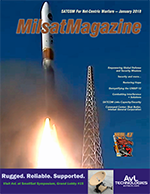 MILSATCOM networks face many challenges. Skot Butler is the President of Intelsat General Corporation, a wholly owned subsidiary of Intelsat S.A., the world’s first Globalized Network operator, delivering high-quality, cost-effective video and broadband services anywhere in the world.